Oscar Promis was born in San Francisco on April 24, 1855, the son of French immigrant Geraud Promis who had arrived in the USA in 1848. In 1858, the family came to Victoria – Geraud was a grocery retailer – undoubtedly drawn by the gold rush. They lived here until 1873, accumulating downtown property. Although Oscar returned to the USA, taking up residency in San Jos, California, at age 18, his family retained their ownership of land in Victoria until shortly before his death. In his profession as a real estate developer, he made many trips to Victoria during his lifetime. This two storey structure was originally named the Promise Block, a corruption of the owner’s name. It occupies what was once the southeast corner of the original Fort Victoria. The upper storey features glazed brick, moulded terra cotta, and a heavy bracketed cornice. In 1907, the tenants were Samuel G. Clemence – dentist, Pacific Loan Co., Henry S. Griffiths – architect, Charles J. Ellacott – civil engineer, Maggie Wilson – dressmaker, British American Timber Co., B. C. Dental Supply Co., H. H. Jones – real estate, William C. Stewart – real estate, H. J. Rouss Cullin – architect and Griffin W. Jones – real estate. For many years in the 20th century, it housed Paulin Travel. In 2000, the building was restored and many of the original features that had been obscured in unsympathetic renovations, were revealed. 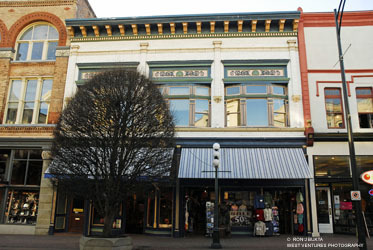 Today, the building houses a Native Arts outlet and a souvenir shop.